This was a tweet of Ms. Kels of G-Force. I hope they're talking about SG. Edit: Just checked it out and yes they're talking about Sarah. Watch out for later! Expect to be floored. Again! wow! too excited for this Simone Naobe....thanks for sharing!!! aabangan ko talaga ito at magpupuyat ako ng bonggang bongga! wow! A dance presentation from Sarah later - OMG! Can't wait. I'm suuuper excited. Kakain ako ng lunch ng maaga para wala akong ma-miss na Sarah moments. weeeeiiiihhh!!! Chat with your favorite ASAP stars! Mga Kapamilya! Maki-chat na with your favorite stars LIVE mula mismo sa ASAP backstage! 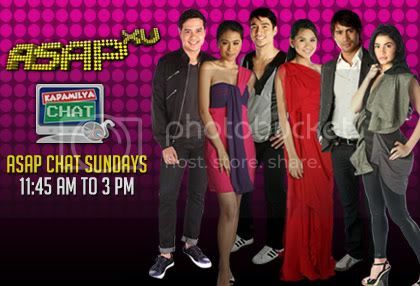 Mag log on na sa chat.abs-cbn.com on Jan 3, 2010! sa WOWOWEE at interview sa EL! !